﻿ How to embed flipbook created by 1stFlip Flipbook Creator to WordPress? How to embed flipbook created by 1stFlip Flipbook Creator to WordPress? If you want to embed flipbook created by 1stFlip Flipping book software to WordPress, first you need to upload the flipbook online, whether to upload to own website using the built-in FTP or upload to 1stFlip Cloud server. <iframe style="width:600px;height:375px" src="URL of the flipbook"
Width and height of the flipbook are changeable. 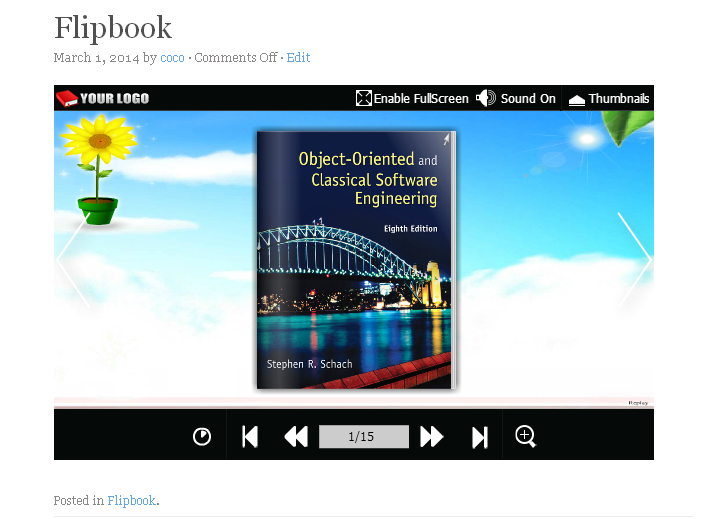 Click the Publish button and then you can see the flipbook in the WordPress blog. Download the flip pdf software free trial to create your flip pdfs, flip magazines! 2016 © 1stFlip. ALL Rights Reserved.